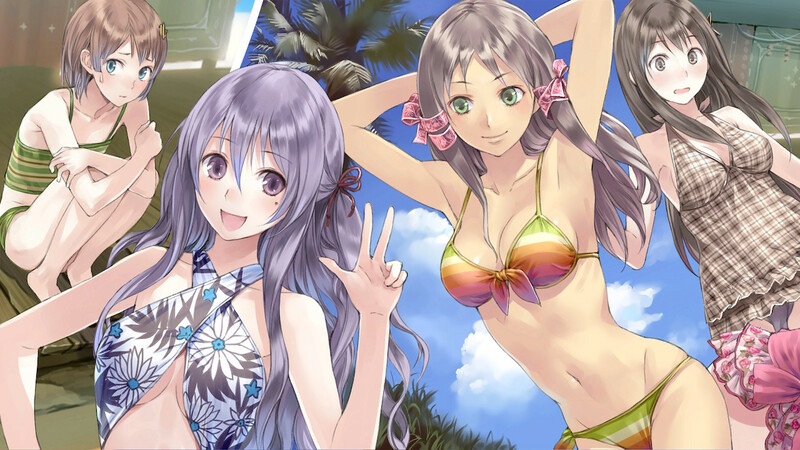 Atelier Totori’s narrative setup is rather different from Atelier Rorona. For starters, it doesn’t unfold entirely in Arland and its surrounding area; as we join the story, Totori is a young girl just getting started with alchemy in a little seaside village named Alanya. 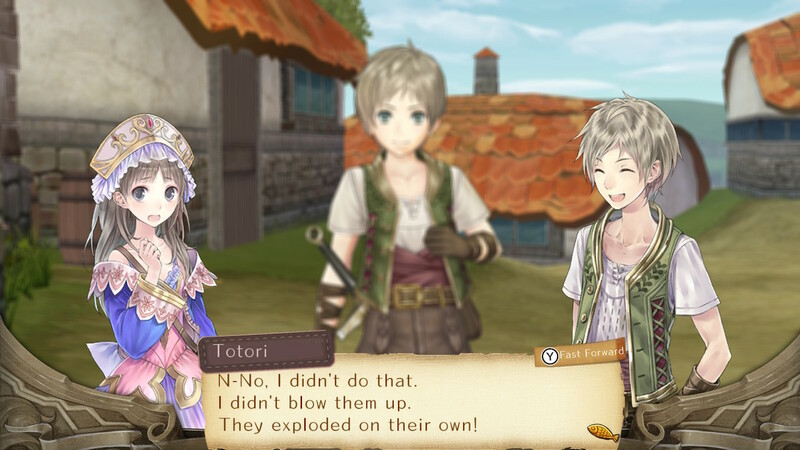 Much like Rorona at the start of her own game, Totori is initially not very good at what she does, having something of a tendency to cause large explosions in her workshop. Her older sister Ceci tends to be the one who ends up cleaning up her messes; she complains a lot but actually doesn’t seem to mind all that much. Tensions begin to rise in Totori’s family when she decides she wants to go in search of her missing mother. In order to do so, she will need to acquire a license and become an adventurer before she is permitted to go out into the big wide world. 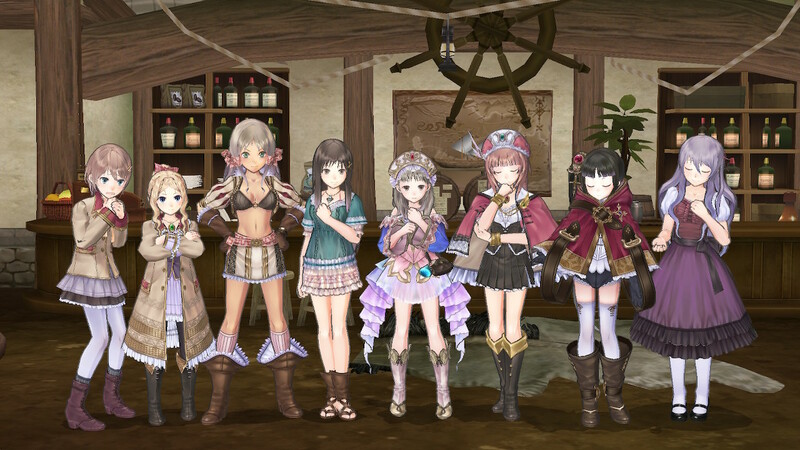 The reasons for this apparently new licensing system were hinted at towards the end of Atelier Rorona Plus’ new Overtime segment; there are a number of events where Cordelia comes complaining to Rorona about a sudden influx of gloryseeking wannabe adventurers in the region, and the trouble they have been causing. Over the course of Atelier Totori, it becomes apparent that Totori’s mother was one of the biggest troublemakers out there for various reasons — a stark contrast to the rather meek Totori. But Totori, along with her childhood friend Gino, is determined to become an honest adventurer, follow the rules and help as many people as she can, and hopefully determine the fate of her mother for herself — because everyone around her seems curiously hesitant to speak of it. Ceci even seemingly wants to forbid Totori from leaving the village at all, though she later relents as Totori demonstrates her determination. 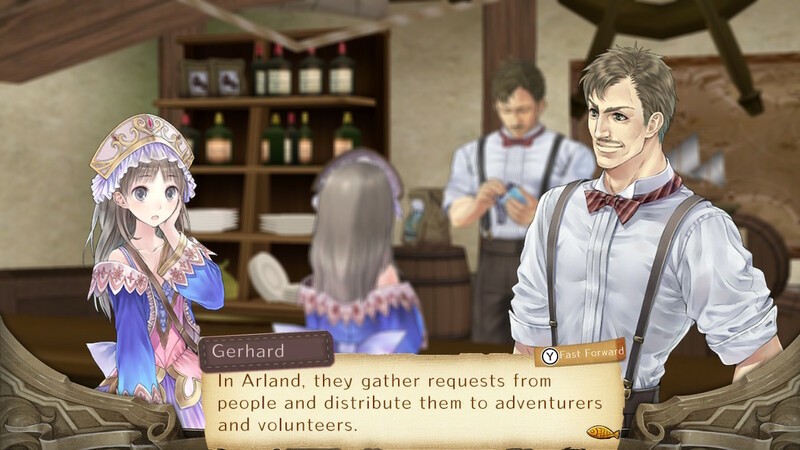 The Arland of Atelier Totori is one undergoing a lot of change. 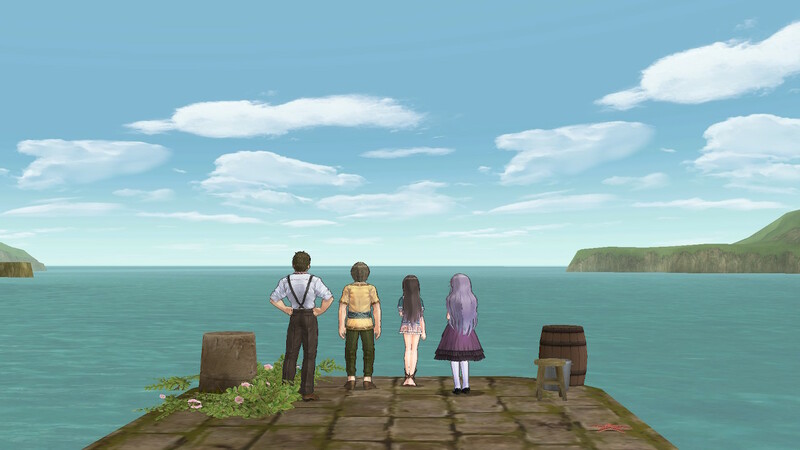 Between the end of Atelier Rorona and the start of Atelier Totori, the kingdom has converted from a monarchy to a republic, continuing the trend of “modernisation” we started to see throughout Atelier Rorona’s narrative — albeit in a rather more peaceful, friendly way than we saw in that game. 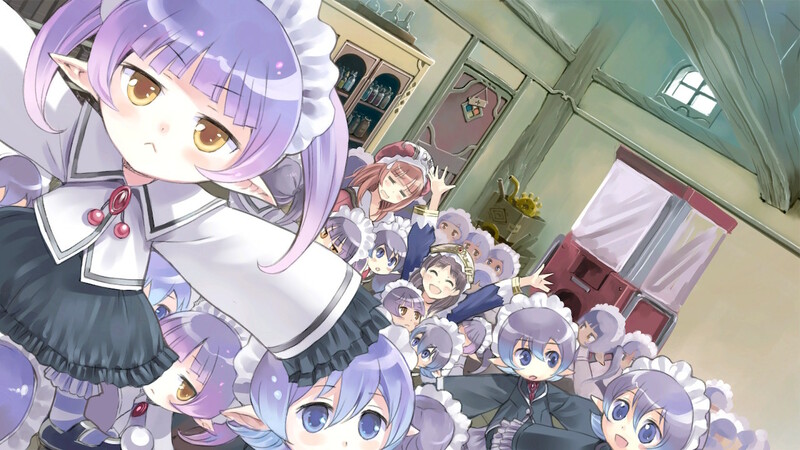 Rorona’s previous success saw her convincing main antagonist and bureaucrat Meredith Alcock that alchemy can provide a valuable and helpful service to the land alongside new industrial facilities. In many ways, the “new” Arland of Atelier Totori can be interpreted as a land that is willing to embrace modernity without sacrificing traditional values — something which remains important and relevant to a lot of people in the real world today. Part of that process of upheaval is determining how, exactly it is best to administer the adventuring license system, and it’s this aspect of the narrative and setting that provides the main structure for the majority of Atelier Totori. Rather than providing you with short-term goals as in Atelier Rorona, Atelier Totori simply provides you with one long-term goal — rank up your adventurer’s license to a certain point within three years — and then leaves you free to tackle that process however you see fit. To increase the license’s rank, you need to earn points. These points can be earned via a variety of activities, split into four broad categories: Battle, Exploration, Quest and Library. 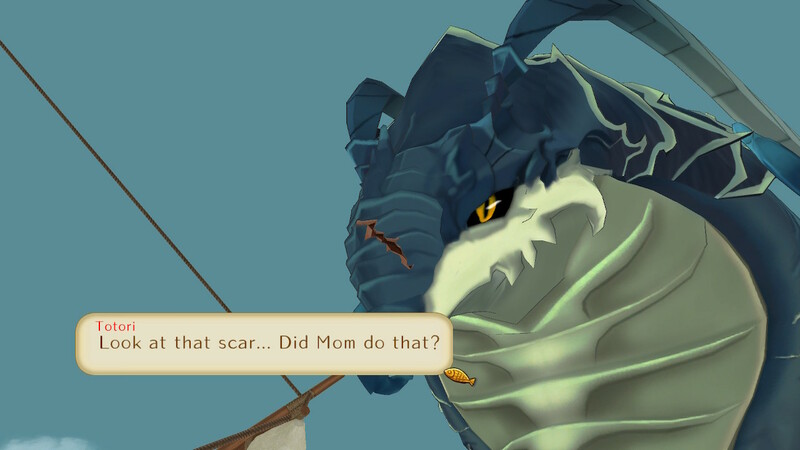 Battle tasks, as you might expect, revolve around defeating monsters. Points can be earned for reaching various adventurer level milestones — like in Atelier Rorona, Totori’s adventurer level increases through combat and alchemy through synthesis — as well as defeating specific powerful enemies or groups of regular enemies. In many cases, completing these objectives rewards you with specific, permanent buffs to Totori’s abilities; completing the tasks that require you to defeat specific types of monsters cause you to deal additional damage to that type of monster in the future, for example. Exploration tasks, meanwhile, can be divided up into a number of subcategories. Firstly, a number of objectives require you to “map” a specific region of the overall world map — which, unlike Atelier Rorona, is now node-based rather than simply radiating out from a central “hub”. “Mapping” a region requires you to visit all its component zones and dungeons; increasing Totori’s license rank allows her to go further afield and visit more areas, so in a lot of cases the “map [x] region” objectives won’t appear until Totori is physically able to get to all the locations required to succeed. Also within the Exploration subcategory is the requirement to find specific landmarks in a particular area. The explorable areas in Atelier Totori can be split into two broad types: small areas that are primarily intended for gathering alchemy items, and larger, more elaborate “dungeons”. The former feature a variation on the main exploration music “Following the Footsteps”, with varied instrumentation according to the overall “theme” of the area — the islands you visit later in the game feature tropical-style instrumentation such as steel drums, for example, while the arid wasteland area features middle-Eastern sounds. The latter, meanwhile, tend to have unique music and architecture as well as these “landmarks” — quite simply distinctive or otherwise noteworthy scenery features. The Exploration tasks are some of the most enjoyable in terms of feeling like an actual “adventurer”. In many ways, they’re some of the simplest to complete — although some later ones that require you to track down every gathering point in a large, sprawling area can be quite challenging, particularly when tough monsters stand in your way. There are even some tasks that require you to find certain locations “before anyone else”; the game doesn’t make it entirely clear how you qualify for this, but it’s satisfying to enter a new location and discover you’re the first person to set foot in there for a very long time indeed. Quest tasks are pretty self-explanatory — they’re to do with completing requests. Initially, Totori takes requests from her village’s bartender to help out with things in the local area, but once she finally reaches Arland, she meets Cordelia to make her adventurer status official, and from thereon she receives requests from Esty’s rather jittery sister Filly. Much like in Atelier Rorona, quests are simple affairs that require you to either synthesise specific items, gather particular items, or defeat a certain type of monster. Atelier Totori introduces a tiered reward system, whereby you’ll receive a greater choice of item rewards for your efforts if the items you find or create are of higher quality (or more accurately rank — more on that in a moment). For hunting quests, you’ll get a better rank the sooner you complete it. The quest objectives in the adventurer’s license range from simply completing a particular number of quests in total to completing a number of quests before they “come round again” in the game’s calendar, completing certain types of quests and attaining the maximum possible “S” rank on all the three different categories of quest. Since quests form the main way through which Totori earns money throughout the entire game, these are also some of the most straightforward objectives to accomplish, since you’ll almost certainly always be working on some while doing other things. Finally, the Library section of the license concerns Totori’s alchemy skills. Its objectives include levelling Totori’s alchemy level to various milestones, synthesising all the recipes in each of the various recipe books you acquire over the course of the game, synthesising particular groups of related items, creating equipment and filling out the item, character and monster libraries in the menus. These tasks represent Totori’s growing knowledge and understanding of not just alchemy, but of the world outside her village. So we’ve established that the overall structure of Atelier Totori is rather different from Atelier Rorona; how about the moment-to-moment mechanics? Well, let’s take a look at them a bit at a time, beginning with the alchemy system. As in Atelier Rorona, item recipes call for one or more types of ingredient. Sometimes these ingredients are simply a broad “type” of item, at others they are specific things. The combination of ingredients you choose determine the base quality of the final item you’ll produce, its effect if it is a usable item, and the traits you can potentially pass along within the “cost” limit. The final product also has a letter grade from E (lowest) to S (highest), which is affected not only by the quality value, but also by how much cost’s worth of traits you successfully applied to the item. In other words, in terms of execution, it’s pretty close to what we had in Atelier Rorona Plus, which in turn was effectively backported from third game Atelier Meruru. As a result of this slightly convoluted history, Atelier Totori (which received no such mechanical refinements for its Plus or DX incarnations and thus effectively remains something of a “prototype” of what was to come) ended up feeling more dated in mechanical terms than both the remake of its immediate predecessor and its sequel thanks to the absence of just a few nice little quality of life features that both Atelier Rorona and Atelier Meruru sport. Probably chief among these is an issue that comes up when you are attempting to create an item which passes through several “iterations” — in other words, to make the final item, you first have to make a specific ingredient. In both Rorona Plus and Meruru, if you’re lacking that synthesised ingredient item, you can immediately switch over to that recipe directly from the one you’re trying to complete. In Totori, meanwhile, you have to go back to the main recipe list and manually select the ingredient. It’s not a massive inconvenience or anything, but it may jar a little if you’d become accustomed to the more refined experience both Rorona Plus and Meruru offer. Another issue comes up when attempting to synthesise weapons and armour for Totori and the various companions she is able to recruit to accompany her on her adventures. 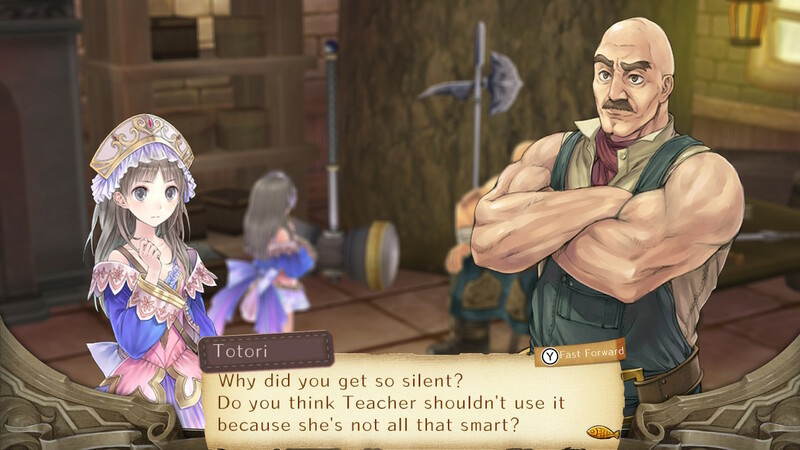 Like in Atelier Rorona, Totori acquires new equipment by making use of the services of Hagel the blacksmith (who has since embraced his baldness and removed his hat… aside from one memorable sequence when Totori first encounters him). However, this time around, a new piece of equipment only requires one component item rather than the two needed in both Rorona and Meruru. While this makes it easier to acquire new equipment, it also means it’s harder to pass down a large number of helpful traits to a piece of equipment, since you have to try and cram as many as possible into a single Ingot or Cloth item — not always easy or practical. The other issue with Hagel’s shop in Totori is that you have no idea what ingredients he’s looking for to make a particular item. While both Rorona Plus and Meruru indicate exactly which component type Hagel requires to create a specific item — even if you haven’t discovered the details of that item yet — in Totori you just have to sort of show up with a random collection of metal and cloth and see what happens. Again, not a major issue — but it really makes you appreciate the refinements in the other two games! 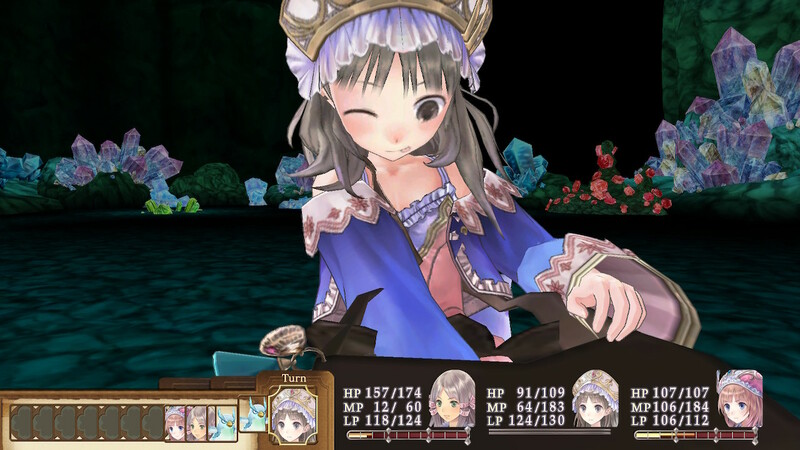 Synthesis of both items and equipment is very important in Atelier Totori because the titular heroine starts out extremely weak in combat — a mechanical reflection of how her rather timid personality is depicted at the outset of the game — and thus spends much of the game having to rely on her consumable items such as bombs. To counterbalance this, her early adventures are accompanied by some strong companions who have helpful abilities — though managing their limited magic point resources can be a challenge in the early levels. Later in the game, Totori is able to create equipment for herself that makes her a more formidable fighter, but it remains a good idea to make use of items as much as possible, as these allow for things like elemental damage and status effects to be added fairly reliably. It can seem quite time-consuming to keep Totori well-stocked with these consumable items at the outset of the game, but thankfully she gets some help; after re-establishing contact with Rorona (who, of course, was her alchemy teacher) the pair manage to create a somewhat lesser version of the homunculus Astrid surprised Rorona with in the previous game. Pint-sized and unable to say anything other than “Chim”, Totori discovers that these little artificial beings are more than happy to churn out items and gather materials for her — so long as she keeps them well-fed with pies. Yes, unlike Hom in Atelier Rorona, who would just get on with things in perpetuity until you told them to stop, Chims will only work if Totori has some pie in her Container at her workshop. 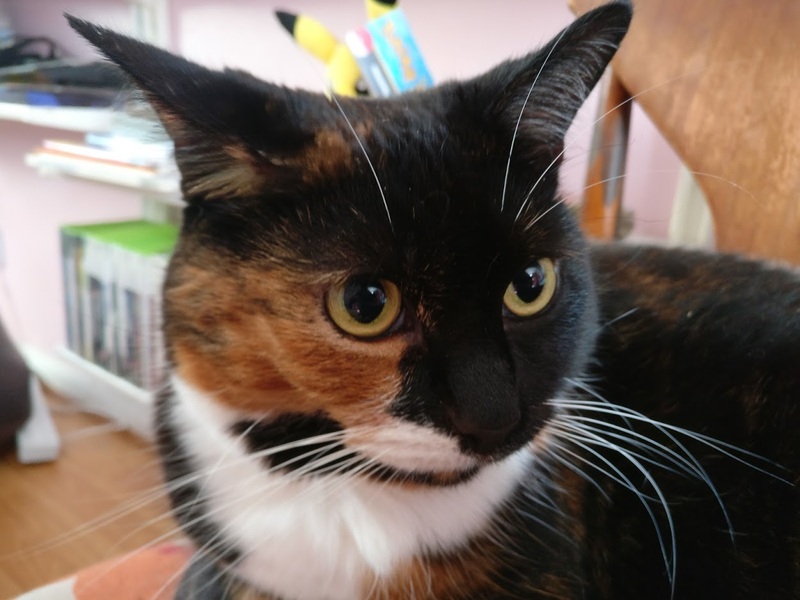 Fortunately, pie is reasonably easy to come by, but it’s an additional consideration to bear in mind that adds to an increasingly large list of “responsibilities” the game gradually saddles you with over time. An interesting variation between Chim and Hom is that the former can only gather or synthesise something that Totori currently has in her inventory, whereas Hom was able to synthesise things Rorona had previously created or gather from locations she had previously been to. This means it’s a good idea to keep single instances of helpful items in storage rather than using them whenever you can, just in case you need large quantities of a particular item at short notice. Proper planning prevents poor performance and all that. You’ll notice that I’ve referred to Chim in the plural so far, whereas Hom was a single being. That’s because in Atelier Totori, you are ultimately able to produce up to five Chims in total, allowing for a much wider range of things to be automated all at the same time. With some Chims on pie-making duty, you can even make them self-sufficient to a certain degree, though it’s generally a better use of their time to produce more directly helpful items than simply keeping themselves running, particularly as you can just buy pies from Ceci if you have enough money to do so. Going back to Rorona for a moment, it’s interesting to see how she’s been treated as a character. While there’s little doubt that she grew enormously in terms of maturity and responsibility over the course of Atelier Rorona, her depiction throughout Atelier Totori (and on into Atelier Meruru — though that’s a whole other issue we’ll get to soon!) shows that despite her being well into adulthood by this point, there are still certain aspects of life she struggles a bit with. Okay, a lot with. Indeed, her main reintroduction to Totori’s life comes when Totori’s father accidentally fishes her out of the ocean after she got lost and fell into a river. This is quite interesting because it’s kind of building on the backstory Rorona has of not really having a particularly strong role model to latch on to. She had her parents, sure, but they were absent for the majority of Atelier Rorona, even as she was working to pay off their debt, and her alchemy teacher Astrid most certainly is not what one might describe as a particularly positive role model for a young girl to follow. As such, it’s not altogether surprising that adult Rorona has ended up as something of a flighty, airheaded ditz, but it’s rather touching to see how she attempts to rein in the more exuberant, chaotic aspects of her personality for Totori’s sake. Totori adores Rorona; she admires her talents and accepts her flaws. Rorona, meanwhile, understands that there is someone relying on her and looking up to her; while Totori did have positive role models at home, particularly in the form of her sister, Rorona fulfils the need she has to better herself and push her limits rather than stagnating in her quiet little village by the sea. But I digress. Let’s talk a little about Totori’s actual adventuring. Stepping out of Alanya or Arland places Totori on the world map which, as previously noted, is node-based. Pathways connect various locations on the map, and ranking up Totori’s adventurer license unlocks new areas. 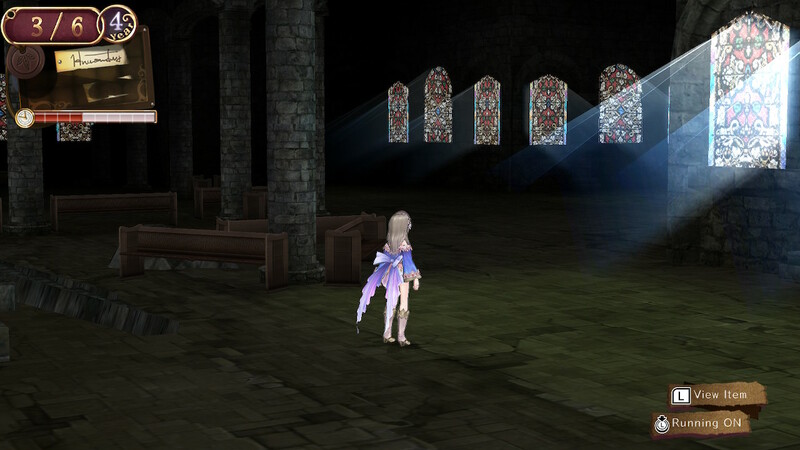 Later in the game, Totori visits some previously unexplored areas; these are revealed one at a time as she explores each one in turn. It takes time for Totori to travel, and this aspect of the game is where the most significant challenge in terms of the overall time limit comes from. Because getting to some of the “best” areas in the game can take a very long time indeed, you need to try and find ways to save as much time as possible. Early in the game, you are able to take a carriage between Alanya and Arland, but this still takes nearly two weeks. However, an optional sidequest allows Totori to synthesise some “upgrades” for the carriage that causes the journey to only take a week instead; this is an important first step in optimising your travel plans. Later in the game, Totori will be able to develop a number of helpful items. Of particular note in this regard is the Warp Gate, which allows Totori to immediately return to either her own workshop in Alanya or Rorona’s workshop in Arland, saving a huge amount of time by negating any need for return journeys. She is also able to create a number of items that, when kept in her basket, save time travelling on the world map and while gathering out in the field. Yes, a big change to how exploration works in Atelier Totori is that gathering items and combat now both consume time as well. 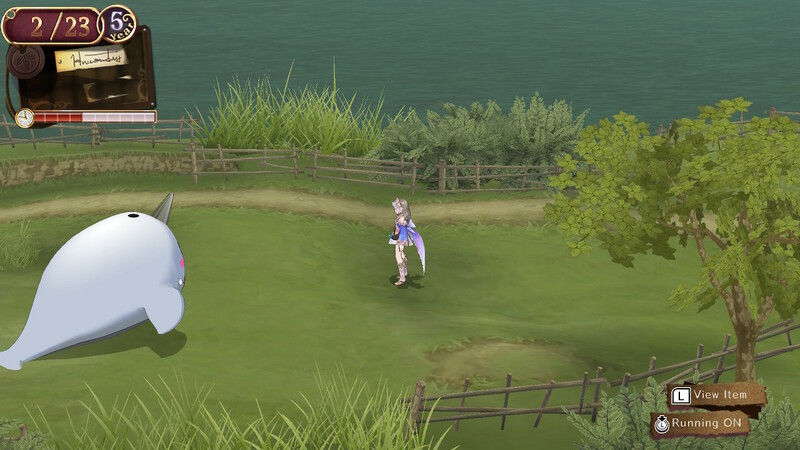 Atelier Rorona simply had each area you explored consume one or more days when you left it — the exact amount generally increasing as you got “deeper” into an area — but in Totori, there’s a small meter in the corner of the screen that drains any time you gather or engage in combat. When this meter empties, a day passes. 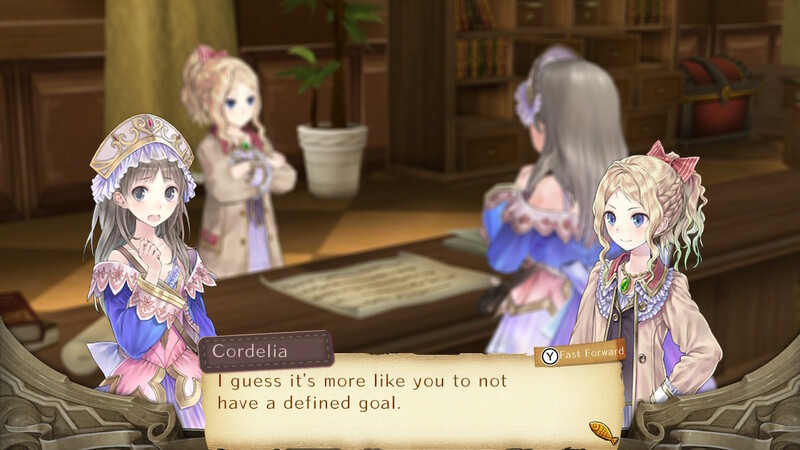 And apparently in Arland, a “day” is defined as “the amount of time it takes to pick approximately ten carrots”; as a result, you’ll need to pay close attention to how much time you’re consuming out in the field and not just blindly hoover up every item you see as in Atelier Rorona. The items Totori can create to save her time in this way fulfil the same function as the workshop decorations in Atelier Rorona Plus and the equippable “Search” items in Atelier Meruru, but here you simply have to keep them in your inventory. This has the unfortunate side effect of meaning that they don’t carry across into a New Game Plus (unlike their implementations in the other two games) — and you’ll also need to remember to actually take them with you on expeditions, too — they’re no good just sitting in the workshop’s Container! Still, at least the Warp Gate has infinite uses (which the game does not make immediately clear before you create it) and the shoes and gloves are easy enough to make once you know where to get the ingredients — you just need to make sure you make some time to craft them, preferably sooner rather than later. Battles unfold in a similar fashion to Atelier Rorona, albeit with a somewhat different screen layout. Totori’s two companions still have an Assist meter (and later a Special meter) which this time is divided into several sections; the higher this meter is when you trigger either an Assist attack or Assist defense move, the more effective that move will be in some way — it might add additional effects to an attack, or provide increased resistance against something. As previously noted, Totori is pretty feeble at the start of the game and so it feels very much like there’s an increased emphasis on consumable items this time around. Totori has the option of either simply using an item outright or expending some of her MP to “Duplicate” it, allowing her to trigger a lesser version of its effect without consuming one of the item’s uses. Making good use of this option can help minimise the amount of extra crafting you (and/or the Chims) will end up having to do between expeditions. 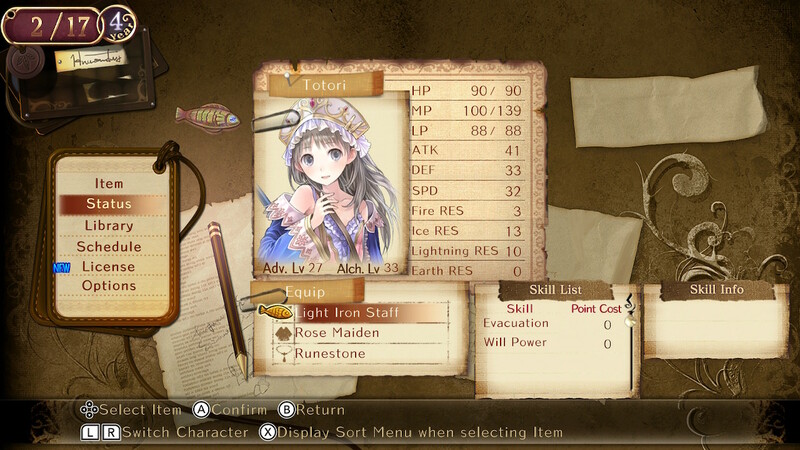 Each individual character might not seem like they have a wide variety of unique moves to use in battle, but the emphasis in Atelier Totori’s combat is on a combination of effective item use, good preparation through equipment and a helpful combination of passive abilities. While levelling, most characters unlock a number of helpful passive skills that might not have as obvious or as flashy an effect as their active abilities, but which can have a real benefit on the battlefield. 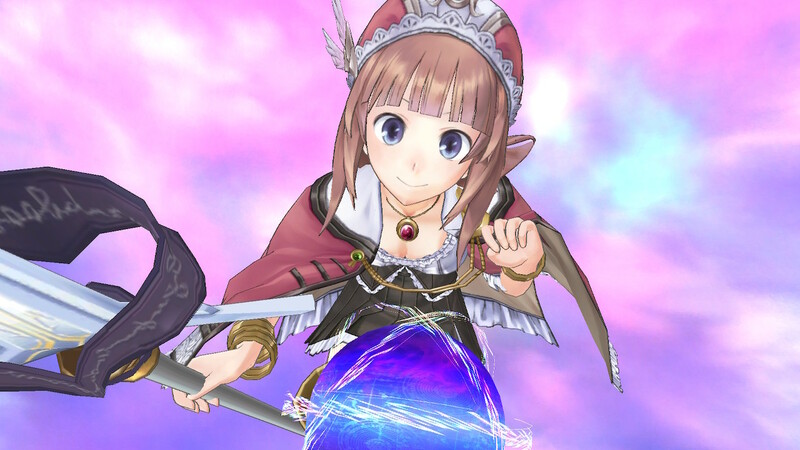 On top of this, synthesising equipment with helpful traits — as in Atelier Rorona, kitting everyone out with weapons that can heal their wielder is an extremely sound strategy — becomes increasingly important as the game progresses and you start to find more and more powerful foes blocking your progress in some directions. Much like Rorona, a lot of the combat is not mandatory; there are a number of powerful bosses throughout the game that you can defeat for a significant boost to your license points in the Battle category, but which otherwise just mind their own business. There is, however, one mandatory boss if you want to see at least the “Normal” ending; with proper time management, you’ll be able to prepare accordingly without too much trouble, however. Bring lots of lightning bombs. The True ending, meanwhile, is not simply a case of “doing the same but better” as in Rorona. No, here it’s an extremely demanding case of having to see pretty much everything the game has to offer, or more accurately triggering all the possible endings in one playthrough. This is a case of seeing all the characters’ events, all the optional events and all the sidequests while simultaneously ensuring that your Chims eat enough pies and that you have at least 500,000 Cole in money by the end of the game. Did I mention that several of the characters’ events are reliant on tracking down some tough bosses and completing some optional content? Yeah. 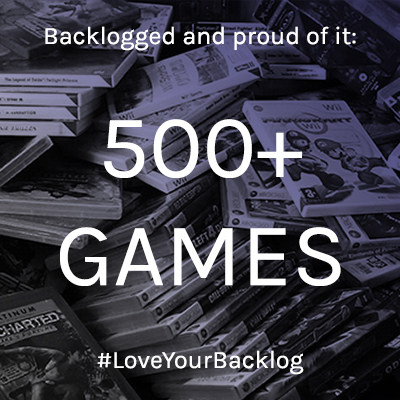 You’re not getting this on your first playthrough without some flawless time management — or a walkthrough — but the Normal ending is eminently attainable without too much difficulty, and carrying across your equipment to a New Game Plus will help save you a bit of time in the long term. 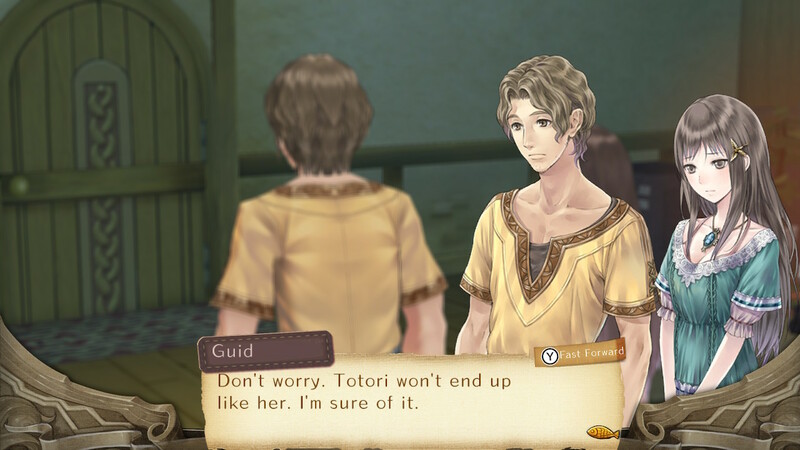 Those events that contribute to character-specific endings and the overall True endings are a big highlight of the Atelier Totori experience, and one reason why I actually recommend you don’t worry too much about going for a “perfect” run the first time you play. You see, a really nice part of the Atelier Totori experience is the feeling of the world going about its business while you are concentrating on what Totori is up to; you’ll find on your numerous trips between Arland and Alanya that various secondary characters (including party members and shopkeepers) will start developing relationships with one another, circumstances will change, rumours will start, things will happen. Allow these events to unfold naturally and the game creates a wonderful feeling of a living, breathing world in which you, the player, are not necessarily the most important thing — Totori’s story is just one of many things that are going on at any given time, and by watching what goes on around you, you’ll develop a real appreciation for both the overall setting and the various characters who populate it. 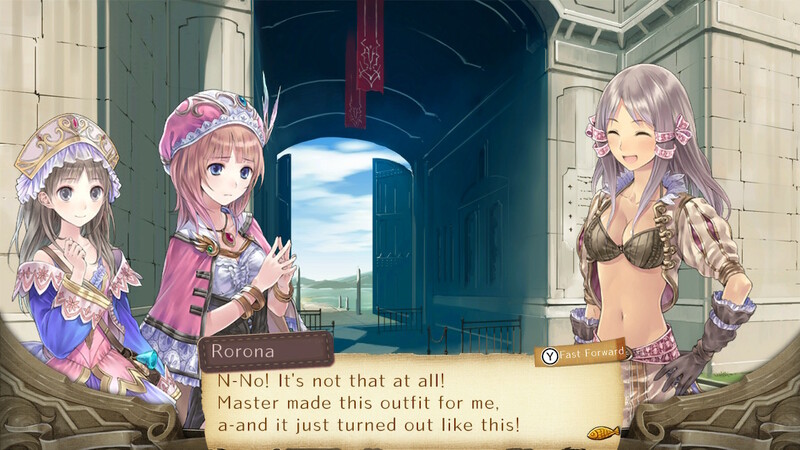 If you’ve just played Atelier Rorona in some form, you’re in for even more of a treat as you see how various characters have grown up and matured over the course of the last five years. 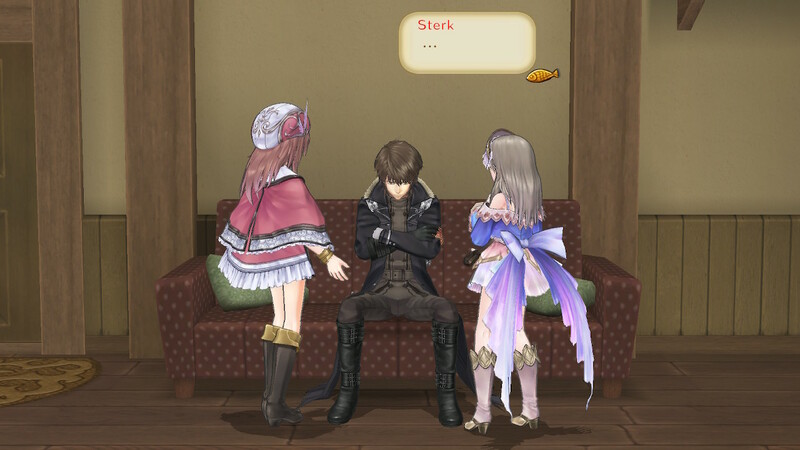 One interesting part of all this that some people will like and others will hate is the fact that Atelier Totori expects quite a bit of the player in terms of remembering “commitments”. On numerous occasions, characters will make a seemingly throwaway reference to something happening “in a few days”, “at the end of the month” or something similar. Pay attention to these! While Totori does have a “memo” section in the menus, this is only for a few select ongoing sidequests; she doesn’t note down specific important dates (including the final deadlines for submitting her license!) so you’ll need to either remember them or write them down yourself. Because you most certainly will miss out on something if you don’t show up when something interesting is supposed to happen — and you’ll miss out on some great Mel Kishida event artwork and amusing scenes in the process. 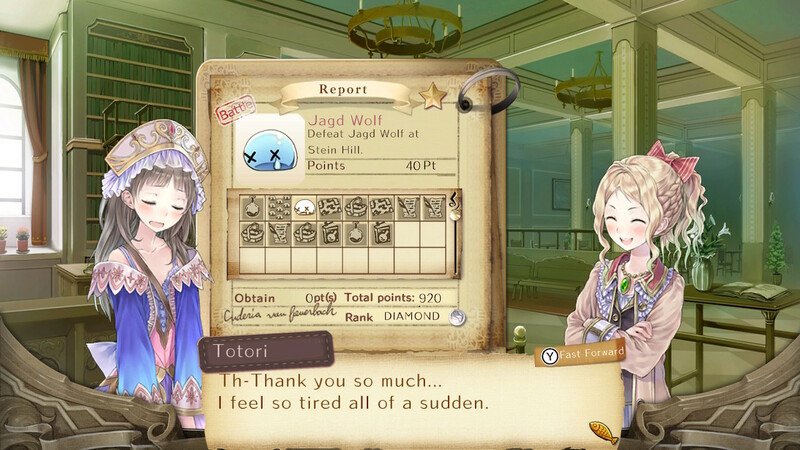 Its few little post-Rorona Plus niggles aside, Atelier Totori is a great second installment in the trilogy. It successfully uses similar mechanics within the context of a completely different overall structure to create a game that feels very fresh, yet still recognisable as part of the same series. It maintains that delightfully warm, cuddly feeling of “niceness” that Rorona has while expanding its scope considerably and telling a much more ambitious tale with a wonderfully colourful, memorable cast of characters. In other words, it’s by no means “more of the same”; it’s a thoroughly pleasant combination of the familiar and the unique, and this tradition continues with Atelier Meruru, as you’ll see very soon. 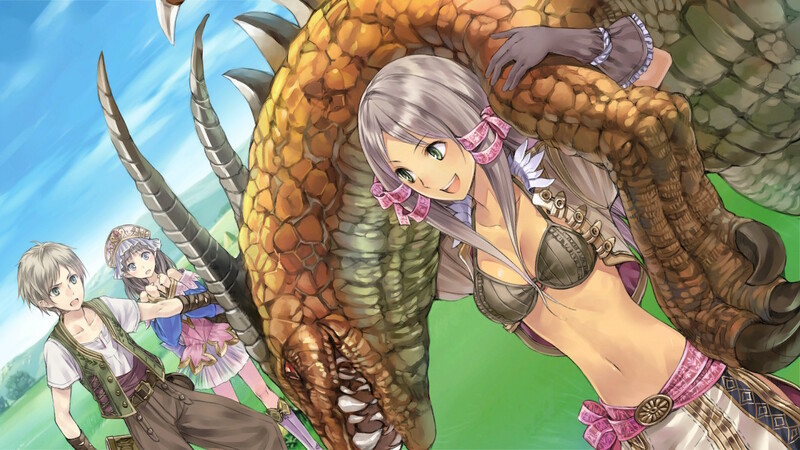 Koei Tecmo provided a review copy of Atelier Totori DX for Nintendo Switch for the purposes of this article. I was stressed out just reading this article. 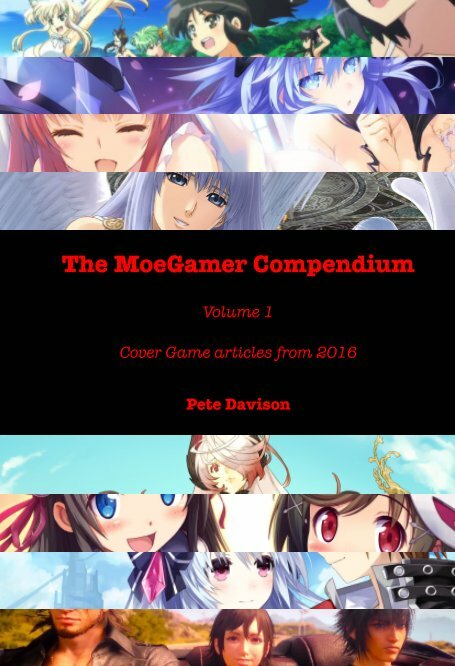 Sounds like my decision to pass on the Arland trilogy may have been right for me after all. Using time up just to gather items? no thanks!